If you have already registered, you should have received this and more information by email last week. If you didn't receive the email, please contact Dave Rosato or use this form. If you have any questions, comments or suggestions, please contact Dave Rosato or use this form. Unfortunately the capacity for the reception has been reached so please do not come unless you have registered. If you did register then the following should have been in an email sent to you. The Welcome reception is from 6-8pm Friday evening, October 26th. It is being held on the USS Yorktown at Patriots Point in Mt. Pleasant. There will be hors d'oeuvre and a cash bar. The poster painting by Panagiotis Mitos will be on display. Don’t forget to enter the raffle to have your car painted by Panagiotis. 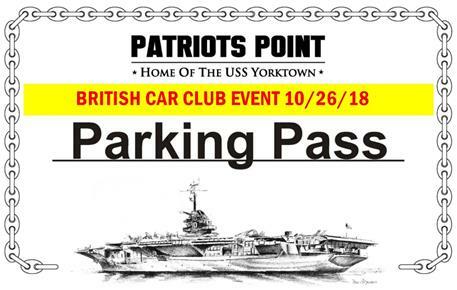 For those who have signed up for the Welcome Reception, below is the Parking Pass for the parking lot to the USS Yorktown. You can either print the pass and show it at the gate or you can show it at the gate displayed on your phone. When you registered for British Car Day, you reserved a number of places at the reception. Upon entering the USS Yorktown Fantail please show a printed copy of the pass you received or show it on your phone. Unfortunately, we reached the capacity of the venue so can only accommodate the number you reserved when you registered. For those who attend the Welcome Reception, you will be picking up the BCD bag. In the bag are two tickets to the Palmetto Islands County Park. Please turn them in at the entrance gate at the park Saturday morning. For those who do not plan to attend the reception, please pay $2.00 per person to get into the park at the entrance gate. As you proceed into the park, follow the signs to BCD registration. Here you will pick up your bag and be reimbursed for the park entrance fee, up to $4. For those who have their BCD bag, you do not have to stop at the registration table, just proceed to have your picture taken. After the registration table you will be directed to the photographing area. Two pictures will be taken. In one of them, please display your participant placard. You will next be directed to the field. Below shows the Park Gate on the left. Across from the Dog Park you will turn left onto the grass, following the red line shown. The two shelters in red can be used to rest, eat or get shade. 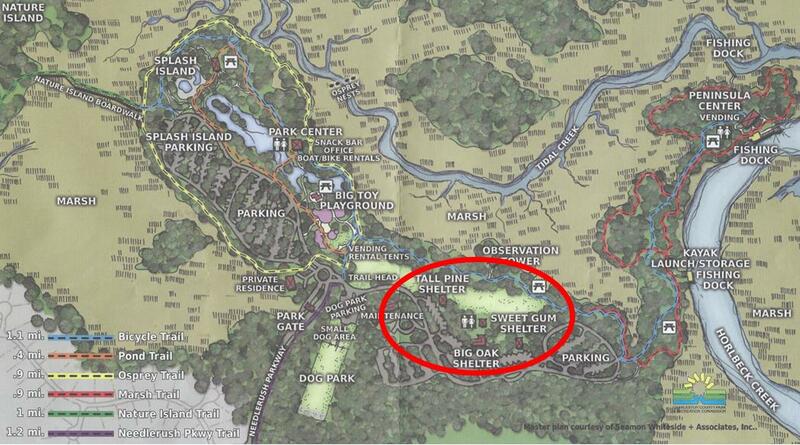 Rest rooms are shown adjacent to the Sweet Gum Shelter. There will be volunteers directing you where to park. In the BCD bag is a voucher for a British Car Day Tee Shirt, for the size you specified. During the day, go to the main tent and pick up your Tee shirt. If you also ordered Polo shirts, Millie will have them at the Regalia Table.